Hey guys, if you’ve read my previous post, I installed OpenCV from prebuilt binaries. But the modules in OpenCV 3.0 are limited and if you want to use other features (which you will eventually) like the face module for face recognition you’ll need the opencv_contrib as well. I didn’t find any reliable sources showing how to install opencv_contrib so after working it out for a lot of time I finally figured it out. The opencv_contrib has many modules and you won’t need all of the features. It takes a lot of memory anyway (and time to install). In this post I’ll show you how to build OpenCV from source and add specific modules from the opencv_contrib which you need. I suggest you read my previous post and install OpenCV from prebuilt binaries and try a few sample programs before you build from source so you understand the difference. For some reason a lot of my code didn’t work before and threw an exception when I tried debugging it, but it worked in Release mode. I wasted a lot of time trying to figure out why it did. But after I built from source, it worked fine in Debug and Release mode as well. If you have time, go ahead and try it out yourself. So let’s begin. Download the word file and follow the instructions while watching the video or you can just read it from here and then try it out yourself. Extract opencv_contrib. Choose which modules you want. 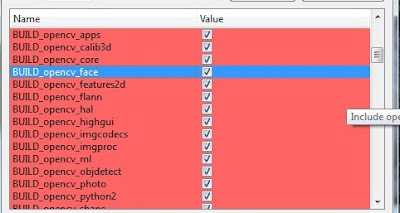 Go to the Opencv folder you extracted. There are two folders inside, ‘Build’ and ‘sources’. Delete everything inside the build folder. Copy everything from the ‘sources’ folder and paste it outside. Note: Opencv3 is the folder where I extracted opencv for this demonstration. 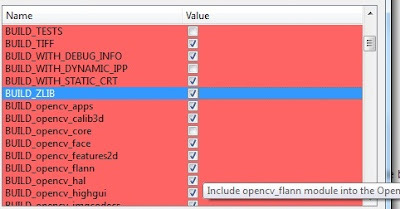 You can extract it directly and it’ll save your folder as opencv by default. If you extracted opencv-master, create a new folder build inside it. Go to the opencv_contrib, from the ‘modules’ folder inside it, choose the modules you want and copy paste them in the Opencv ‘modules’ folder. Open Cmake. 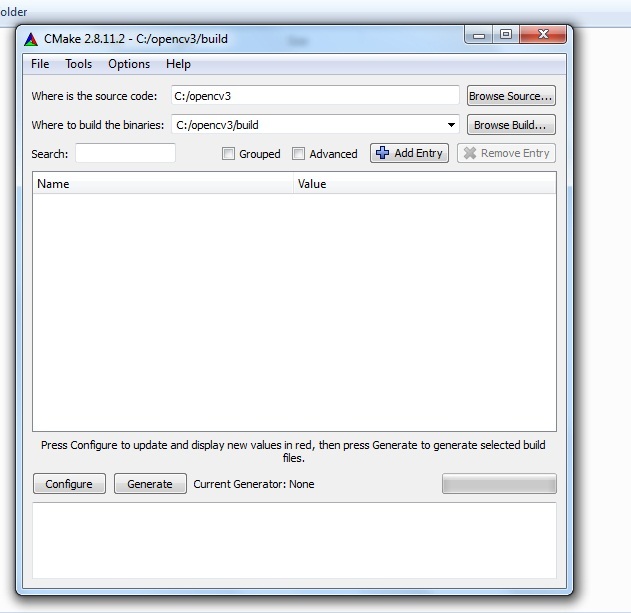 Browse source to the main folder you extracted Opencv 3.0 and browse build to the build folder inside it. Wait for the analysis to be done. After it’s done. Mark appropriate fields as show below. After you've marked everything, click Generate. This will create an 'OpenCV.sln' file in your build folder. 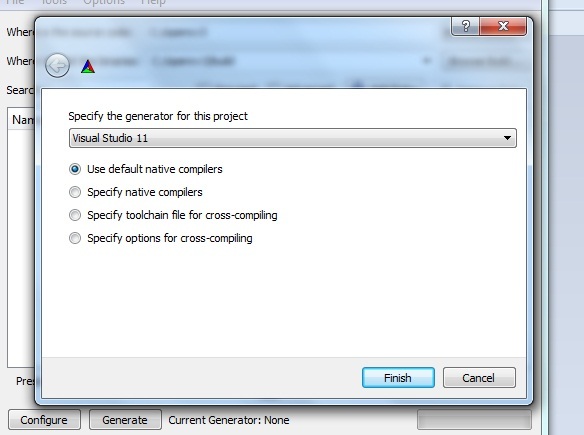 Open it with Visual Studio. After that, right click on INSTALL and build it, Once it's built, again change the build mode to DEBUG and repeat the same step. Everything will be created in the 'install' folder. and if you've installed extra modules you'll have to include those libraries as well. This list contains the default libs and the extra 'opencv_face300d.lib' from the face module. 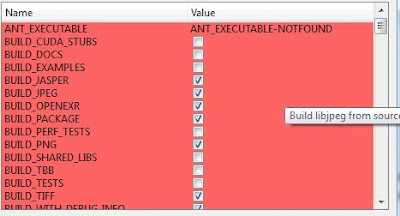 Include extra libraries of the modules you've installed. Copy -paste it, build it and Debug. Hi, please mention that where we can find "extra libraries of the modules"? Is it in install folder? did you got any reply ! i want the same thing !! I need to use SURF and SIFT opencv methods. but my program can not find non-free library,. Kindly please mention that where we can find extra modules libraries. It looks something like this"
Should I remove the BUILD_opencv_bgsegm option from the list of cmake options and regenerate the OpenCV.sln file? I have tried this and there are several other modules that I need to remove...I would rather not remove them if there is an alternative solution to my problem. Thank you. How can i build the whole libray, including the extra modules (such as face) into a .jar file that can be used in Java ? Hello I get this error : error LNK1107:invlaid or corrupt file: cannot read at xxxxxx, and I did everything as you said. The above mentioned steps works with MSVS 2015 too!! Mann would you please upload all dll files and library files, my cmake cannot able to create xfeaure2d.dll and othes too. CMake Error: The source directory "C:/opencv300" does not appear to contain CMakeLists.txt. 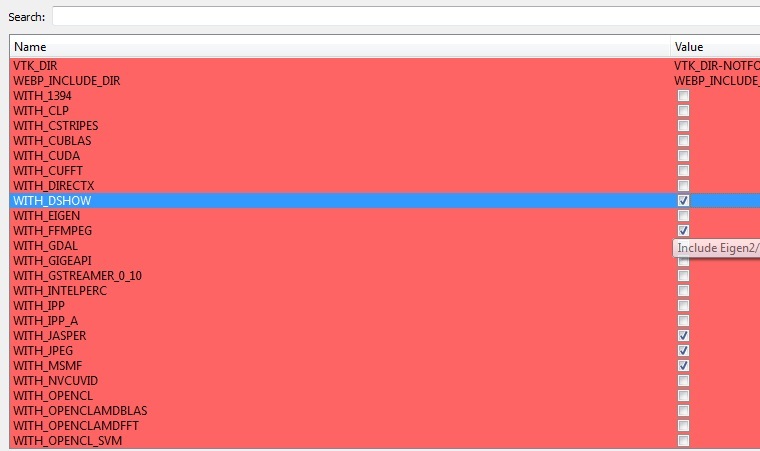 I tried to build "xfeatures2d" for SIFT feature detection. 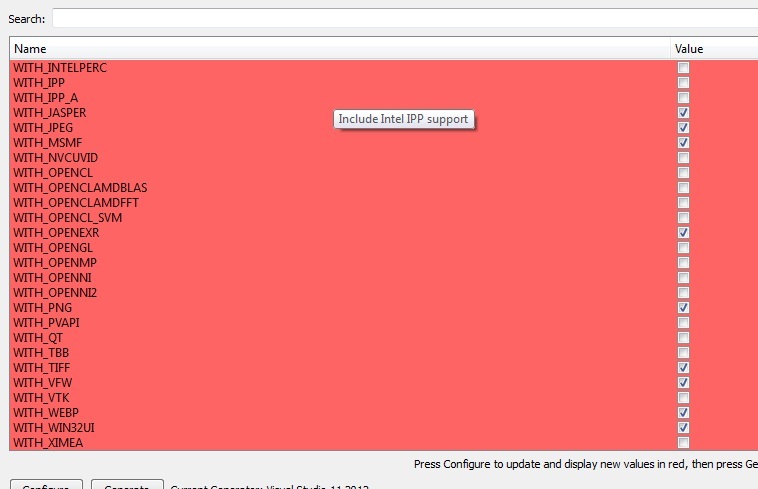 But when I build it using 'ALL_BUILD-->build', I got lot of error messages and build is failed. 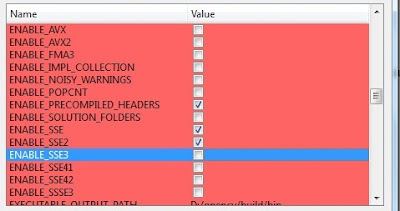 There is a bin folder in your build folder : there are opencv_world310d.dll and opencv_world310.dll in the respective folders. Inside the Install folder is the include folder that you need for the includes. Thank you very much! I works great! You should NEVER copy modules from opencv_contrib to opencv. You should rather add the opencv_contrib module path to your opencv cmake configuration. The cmake variable to do that is OPENCV_EXTRA_MODULES_PATH. 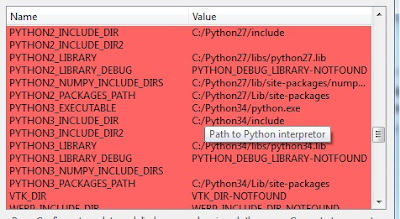 If this is set to the path opencv_contrib/modules, cmake will automatically add all contrib modules to your current opencv configuration. Then you can quickly turn on and off any contrib module you desire for your opencv build. can u tell me exactly how you do it, i am trying the surf and sift now, but the error shows the xfeatures2d not found, and this is my email bbraptor.lee@gmail.com if u wanna help. Thank you very much!It helps me. Hi. I've been following your tutorial since morning and I'm trying to use SURF. I want to use the VIZ library and it is not in the install folder... please advise how can i use it? ?